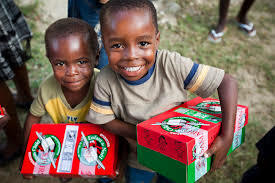 You know we are getting close to Christmas when the red and green Operation Christmas Child shoeboxes come out! Thank you to those of you who are participating in filling the boxes full of wonderful and thoughtful gifts for children in South America. On Sunday we will be taking time in the service to pray over the lovingly filled boxes, and for the children who will receive them, before the boxes leave the church and are shipped off to their final destination. Amberlea has been involved with this extraordinary ministry for years, but do you know the story? Do you know how it all began? It all began in 1990 when Dave Cooke, a father of four from Wrexham, North Wales, was watching the news on TV. He watched in horror as he learned of the abandoned children in Romanian orphanages. He was heartbroken by what he saw and he decided he needed to do something about it. He wanted to show love to these children who would go without at Christmas. So he got an idea and asked his friends to help him fill a truck with toys and drive it to Romania. His passion around the idea ignited an overwhelming response from his community and Operation Christmas Child quickly established itself as a charity. On December 12, 1990, a convoy of vehicles, including trucks donated by local companies, left for Romania with 17 local volunteers. Among the aid on the convoy were the first gift-filled shoeboxes. The volunteers returned even more impassioned that this good work should continue. In 1995 Operation Christmas Child merged with Samaritan’s Purse, a Christian organization. The shoebox appeal expanded into other countries around the world. In the past two decades Operation Christmas Child has inspired everyday, ordinary people to provide more than 100 million gift-filled shoeboxes to needy children in 130 countries! It was a simple idea, from an ordinary guy, with a clear mission: to minister to children in war-torn and famine-stricken countries by getting to them a shoebox full of toys. Over the past few weeks we have been looking at the book of Nehemiah. Nehemiah was an ordinary guy, a cup-bearer to the king, whose spirit was stirred into action to go back to Jerusalem and “rebuild the walls”. A huge, seemingly insurmountable task — but with God…. he inspired others and the walls were built. For Dave Cooke, a huge, seemingly insurmountable task to get toys into the hands of children — but with God! Today millions of children will receive a box that will delight - a box not only full of toys but also full of our prayers and the love of Jesus. I can just imagine the soul-stirring, Christ-exalting stories of lives that have been forever changed by a simple shoebox. Be inspired. What is your burden? What is God calling you to do? Join us for Part 3 of our series called Change your World. You won’t want to miss it!